I finished painting Eleanor’s ceiling dark blue last night! Some people have wondered about how much input she has over the design, since I seem to be bowing to a four-year-old’s whim. Especially in regards to that ceiling color. I’m no stranger to a painted ceiling, even in a darker color. It’s not exactly playful though, and I would have chosen something more fun for a kid’s room if Eleanor hadn’t insisted otherwise. I told her that I wanted to paint stars on her ceiling, and she said that it needs to be dark blue because she wants to feel like she’s outside at night, sleeping under a starry sky. We looked at several test swatches in her room, but she wasn’t swayed. I would have gone with something closer to the minty background of my inspiration, Osborne & Little’s Coronata Star wallpaper, but I like the way E thinks and it’s her room, so dark blue it is! Now, as for the exact shade, she would have chosen something more primary. These were some of the swatches we had looked at before choosing a color. We went with Sherwin-Williams’ Loyal Blue (very bottom, right), but you can see E’s choice. She’s not going to hold the paint chip up to her walls for an exact match, so I took her input and then chose a similar hue with more depth to it. I would have done the same with any other color that she liked. I love that E has opinions about decorating — it’s seriously cute that she notices end tables and chairs that she likes — but her choices are direction, not dictation. I still have the stars to do before I can call the ceiling done. There’s some metallic paint testing to be done first, though; I want to see how opaque my various options are. Plus the ceiling took about 10 hours to do (dark tinted primer plus three coats of paint), and I think my neck and back could use a break. FYI, I’ve tried the Martha Stewart metallic from Home Depot. I used Golden Pearl. It required three coats to get the opacity I was looking for on a furniture project, but it can be done. Not sure if that’s one of the things you’re looking at, but I thought I’d mention it because after the first coat, I was super worried it was going to come out more glazed-looking than painted. Thanks. I’m hoping to find something that will show up with just one coat since I’m stenciling, but that may be an impossible wish. Craft paint is usually fairly opaque, but I need to test out a few brands and colors to check before I start on the ceiling. Good call on the more muted blue! “direction, not dictation”…I like that. It’s looking beautiful, and the metallic stars are going to be just the thing. I think it’s really sweet that you are letting your daughter have so much input into planning her room. My family moved into a house not unlike yours when I was 7. Having this new (to us), big, old house to explore was such an adventure and it meant so much to me to get to pick out what went into my room. It was the 80s, so in my case it was pink, floral Laura Ashley wallpaper, including a fully wallpapered ceiling. By the time I reached middle school I hated it, of course, and covered it up with fabric and pictures of Jared Leto. But now, when I visit my parents and stay in my old room that wallpaper brings back the best of memories. Yep, I fully expect E to plaster her walls with whatever her Jared Leto equivalent will be. And hey, I wanted dusty rose and gray in the late 80s. My friend had dusty rose plastic hangers, and never before had I been so jealous. 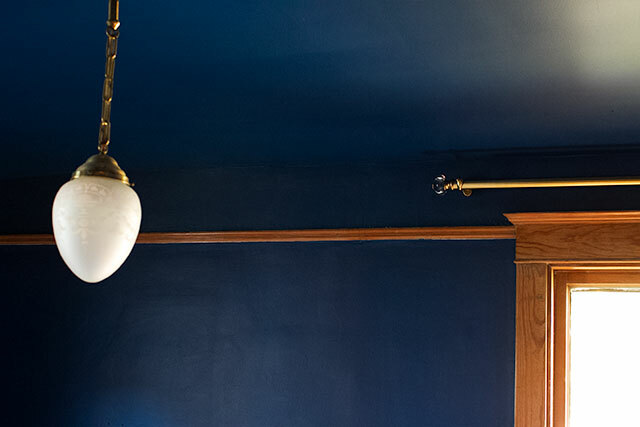 I love the dark blue ceiling — I think it is gorgeous. And I can’t wait to see the stars. Good choices, both of you! I’m with E! I think the stars will look amazing in a dark “night sky”! Can’t wait to see the finished product! I love the way the room is coming together and that Eleanor has some say in it’s design. Can you tell me the name of the SW color in the bottom right on the house shaped swatch? My cabinets are dying for some navy and that just might be the color. Thanks! That’s Indigo Batik, also Sherwin-Williams. Ha ha! I just realized Indigo Batik is the color I painted the front door of my old house. Now if only I could remember the name of the color I painted the outside of that house, it’d be perfect for my family room! I totally came to ask, “what’s the blue on the house shaped swatch?” Lol. 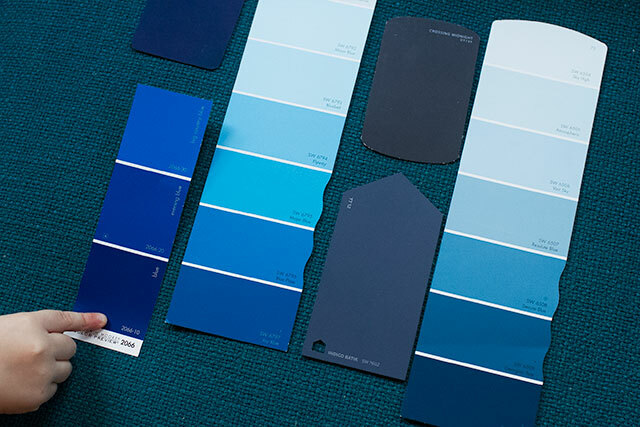 I want dark blue in my bedroom too. :) E is a trend-setter. Honestly, how may people have painted their little girl’s room pink or purple on demand (raises hand). I don’t see how this is any different. It is lovely and so on trend. Can’t wait to see the stars. I absolutely love it – both the room itself and your appreciation of Eleanor’s wants/preferences. It’s a lucky little girl who has a momma who endows her with the power to direct (as you say so well) her own life. It will serve you both well down the road. The paint color really makes the wood pop in the most wonderful way, love it. 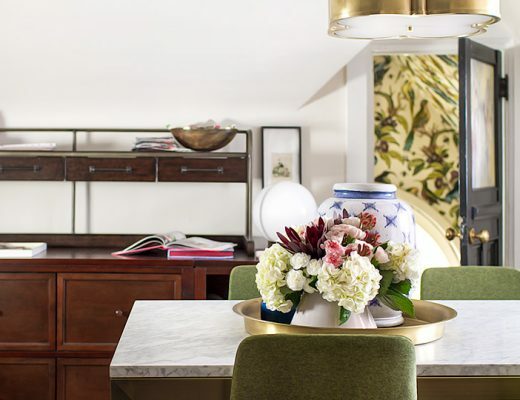 You enjoy and value design and decorating–it’s your livelihood–and you’re introducing your children to it and teaching them to enjoy and value it. Kids can learn so many other great like skills by participating in decorating, like how to manage a project and budget and how to accept responsibility for or live with mistakes. I think it’s super cool that you are sharing these experiences with your kids and teaching them these lessons. I really don’t understand why people are so concerned with how you make your decorating choices. It’s sweet that you let Eleanor have such a voice when it comes to her room. Will she change her mind? Of course she will. She’s four years old. But that’s the beauty of it, isn’t it? You’re letting her play an active role in creating her personal environment, and you can watch it grow and change as she grows and changes. If you have the means to do it and don’t mind repainting/redecorating later, why WOULDN’T you do it? Anyone who spends time criticizing you for it should probably take a moment to criticize the fact their priorities are so astoundingly skewed. I will probably do the same thing with my very opinionated 3 year old. She wants her room to be purple, purple, purple! I’m hoping to convince her of a more muted lavender or lilac color. It’s very sweet that you’re involving her so much in the process. Mostly fulfilling her requests must create an interesting design challenge for you, and surely a happy client in Eleanor! Eleanor is a budding style maven. I love the dark walls, it looks gorgeous. And I love even more that she choose it. Nice work. I almost never comment on blogs but I seriously love that your daughter is getting so much input into her room. The homes of some blogging decorators have amazing children’s rooms, straight from magazines, and all part of a whole-home decorating scheme–that look like no children live there. Our rooms when we are kids are such an important way to express our personality and I love when children actually get a chance to express themselves. I love the idea of non-traditional colors for kids, and it’s even better that she helped pick! I can’t wait to see the finished product! You know I love the stars ;) That blue is such a cozy colour (and sophisticated enough for mom to appreciate too). Starry sky… brilliant idea Eleanor! I really love painted ceilings and I like the dark! It will be so dramatic and yet youthful with the metallic stars! Modern Masters has a great metallic paint line. I buy it from Amazon. I am currently working on a stencil for a client that is based on the Ralph Lauren Constellation wallpaper. Love starry ceilings! Ooh, this one? I considered it for E’s ceiling too! Thanks for the paint recommendation! Yes! And that website is where I bought my sample too – great customer service! Its going to be alot…A LOT…of work, but I am excited. Yes! And I bought my sample from that website too…great customer service! The project is going to be alot of tedious work but I am so excited. darn it…my apologies for commenting twice (now three times). Didn’t see the first reply go up. I’m impressed you got that ceiling done! My Mom was great about giving me artistic input when I was a kidlet. I’d have ideas which she would sort of follow but with her interpretation which usually was more of what I had in mind anyway. It was very powerful and really set the stage for an artistic, creative life. Even though I ended up in high tech education, my creative background helps out tremendously. I’ll admit I had doubts about the ceiling color- but now I can’t wait to see how it all comes together! Your little stylista has great instincts. Also- I hope you don’t feel like you have to defend yourself for E’s input on her room scheme. I think it’s refreshing and wonderful! Naysayers gonna naysay! My little girl is all grown up now, and she is better at styling her home than I am. She chose her first paint color around 1st grade and she picked raspberry. It looked fabulous in our old house with crisp white woodwork. The next room was red, and and last room was fuschia. She always had a cute room, even when it was plastered with Weezer posters. Allowing a child to influence her space is just one of many ways a parent supports and nurtures children. And now I can ask her to help me hang pictures and arrange tabletops! It looks so good so far!!! Have you thought about cutting stars out of metallic vinyl? I painted metallic gold, silver and bronze triangles on a black dresser and it took A LOT of coats of paint to get it to look good. I put up a wall of vinyl triangles that I cut with cricut in just a couple hours, and I’m so happy with the results. (http://www.oleanderandpalm.com/2013/09/wall-of-triangles.htm) Visitors to our home always ask if I painted them on. The blue is awesome. And you are a good mom to give her choices. I was worried that decals would look kind of cheap, but you’re convincing me otherwise here. It’s so great that you’re taking your daughter’s input into consideration (although props to her for having good taste!). I think it will turn out great, and your discussion of how to incorporate the wishes of Eleanor’s wishes is very helpful to those of us who have willful toddlers. I love, love, love the Coronata Star wallpaper. 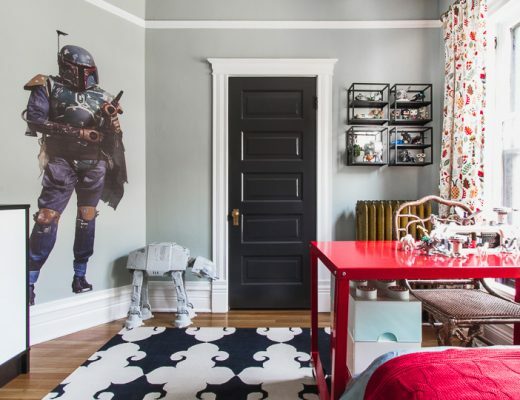 I’m sure you’ve already seen these, but these decals might make the project easier, if you’re interested: http://www.wallsneedlove.com/coronata-star-removable-wall-art/#.UnxbIhDOSIm. At least it might give your back a break! I love that “her choices are direction, not dictation”…we’re embarking on renovations soon and I have a son (8) and daughter (6) who are very definite on their ideas for their first ‘own’ room decor! While I think hand-painted stars are wonderful, I put something on a wall a few years ago (an ampersand in paint). I didn’t think anything of it…. until I tried to paint over it. 10 coats later I can still barely make out the ampersand. Because the paint is different than normal wall paint with a bit of a sheen, it seeps through whatever I throw on top of it. I’ve heard some people make the same comments about even using regular latex paint for a stencil or something and then try to cover it up– it’s difficult! Since it’s on the ceiling and may just be a thing for a few years, I’d seriously consider press-on stars of some sort or decals. Not a beautiful as hand-painted ones, but the consequences could be something you’re grateful for in a few years when a dark ceiling is something desperately no longer wanted by E.
Good point. I’ve painted over designs and seen them come through before, too. Been reading your blog and a few others for a while now and wondered if you were inspired by another (former?) Chicago interior designer, Bailey McCarthy’s, bedroom for this project? No idea how close or involved bloggers are with one another, but I figure it’s a small online world so you must know each other. Right? I think we met at Alt Summit a couple of years ago, and I like her Biscuit bedding! I wasn’t directly inspired by her, but I think she’s really talented.